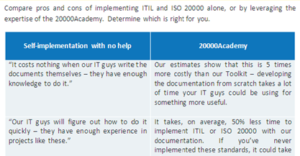 Compare pros and cons of implementing ITIL and ISO 20000 alone, or by leveraging the expertise of the 20000Academy. Determine which is right for you. Implementing ITIL or ISO 20000? With our comparison matrix, decide whether you should hire a consultant or use the guidance from 20000Academy to do it. 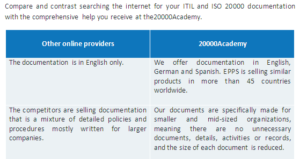 Compare and contrast searching the internet for your ITIL and ISO 20000 documentation with the comprehensive help you receive at the 20000Academy. Not sure which solution is the best for you? The good news is that you have many options for your ITIL or ISO 20000 implementation: you can hire a consultant, you can try it on your own, or you can do it yourself with our support. But, the bad news is – it isn’t really easy to decide what’s best for you. Speak to our resident ITIL and ISO 20000 consultants to understand what next steps you and your organization need to take. If things get confusing, you need expert advice.